rec. Auditorium Parco della Musica, Rome, June 2011. 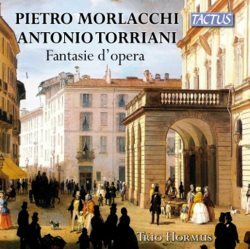 This is the second disc that Tactus have released this year devoted to operatic fantasies. The first, TC800003 was devoted to those works composed and arranged for that much maligned instrument, the bassoon, accompanied by piano. On that occasion the CD featured examples by seven composers and arrangers, including two by Antonio Torriani who is represented on this disc. In the case of present disc we have one work for flute and piano, one for bassoon and piano and two for flute, bassoon and piano, with each combination having something to offer the listener. When it comes to Pietro Morlacchi and Antonio Torriani there doesn’t seem to be that much information at hand. We know that they were both active as instrumentalists, composers and arrangers in Milan during the second half of the nineteenth century. There is not much more to tell, with most information being gleaned from their list of compositions. They were however in the right place at the right time; Milan had been for some years the centre for instrumental music in Italy, with the local gentry leading the way in performance of new kinds of chamber music coming from northern Europe. As the situation changed from chamber music being the pastime of the gentry to one for the music-loving masses, our two composers were well situated to take full advantage of the situation. We know that they were probably extremely talented performers from their compositions and also that they were open to composing music for specific requirements. This can be seen by their Duetto concertato per Flauto e Fagotto, which is known to have been composed for performing during the interval between Acts I and II of Donizetti’s Don Pasquale which took place in November 1851 at the Teatro Lentasio in Milan. The music is highly virtuosic in nature. After all it was composed not only to highlight their prowess as composers, but also as performers. Pietro Morlacchi was one of the leading flautists in the area while Antonio Torriani excelled on the bassoon. Each piece is a feast of operatic themes, which, while I am no great fan of Rossini, Donizetti and early Verdi operas, even I can recognise. These are skilfully woven together to produce music that is charming and highly enjoyable. Works like these were often sanctioned by the original composers of the operas as a means of keeping their music in the public’s mind, or even winning them new admirers. It certainly had me humming along with the music. Trio Hormus prove that they are more than up to the job, which they do with great virtuosity. What’s more they sound as if they are really enjoying themselves. Their tone is pure which is aided by the recording as there is only a slight hint of reverberation from the venue. It all sounds quite natural and pleasing. The booklet essay gives good insight into the musical background in Milan, but a little more information about the composers and especially the four pieces presented here would have been nice. This is a most valuable musical experience, and one which should bring the listener continued enjoyment.